Oh man do you see this cute little man? Babies with a little bit of rolls and squish are the best! Tristan was born at a whopping 11 lbs and his round cheeks are just the sweetest! Bigger babies photograph so well because they are more full and look comfy and cozy in their images. Sometimes littler ones need more props and wraps to help them look comfy whereas Tristan was all set! You could tell he was a big boy at birth because Tristan was also super strong. 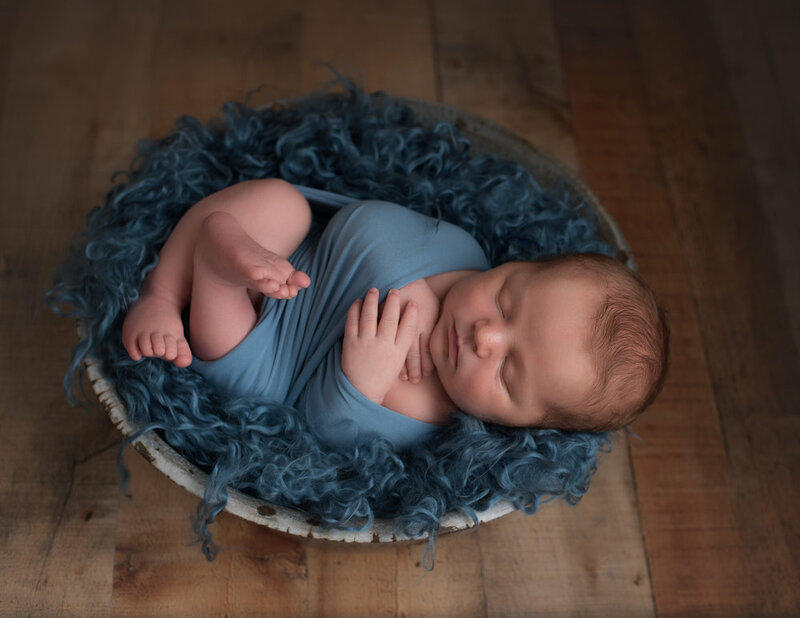 As a Northfield newborn photographer I work with a lot of babies and I have to say this little man is the strongest baby I have ever had in the studio (for a newborn session). While he was still awake there wasn't much convincing him to pose. I had to work my Northfield newborn photographer skills to get him nice and sleepy so he would pose nicely. Otherwise he was too busy trying to sit up! When you put him on his tummy for the tummy time pose he flat out sat up. Once he fell asleep he looked so perfectly cozy and happy! Tristan's session was extra special because I have known his mommy for a really long time. I love working with people I know because their sessions are even more special to me. In this case I went to high school with Tristan's momma and we were good friends. I was so excited for her to have a sweet baby brother for Trenton! Congratulations Loftus family on your new beautiful boy! Life with two boys is quite the adventure and these little guys are so blessed to have one another!